What is Sushi & Sake 101? Sushi and Sake 101 is one of my favorite events that SUSHISAMBA offers; five pairings of sake and a course from the kitchen to correspond with each pairing. 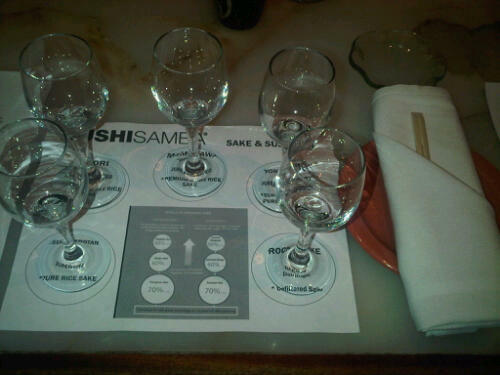 Sushi and Sake 101 is a great event for couples and equally so for a corporate event. The class is taught once a month at Sushi Samba rio and usually takes place the second Tuesday of each month at 6:30 p.m. Make sure to check www.sushisamba.com for the latest updates. Sushi and Sake 101 usually lasts about two to two and a half hours. The beverage manager, Adam Feichter, leads the sake portion of the class. Adam starts the class with a cheer – in Japanese called “Kompai” and then introduces the students to five different varieties of sake, it’s history, food pairings, differences in production and more. Once the beverage manager completes his segment, the class is turned over to Master Sushi Chef Shige Kitano. Shige starts with the introduction and goes into further detail: explaining the purpose of the numerous knives he uses, the importance of the rice, the types of fish, how to slice the fish and the varying styles of sushi. The sake portion of the class. Adam gave a five to ten minute overview of the origin of sake, he explained that sake is over 1000 years old and that it was originally called something along the lines of “virgin spit” (the actual term doesn’t translate to English properly but it was a crowd pleaser). The four main ingredients of sake are Water – Rice – Koji - Yeast. One question that was brought up in my class was the calorie count of sake, sake has about 180 to 220 calories per 5.5 oz. serving. We tried five different sakes that evening. As we progressed through the sake pairings, each grade of sake got higher. A higher-graded sake will have more rice grain polished. A simple rule to follow with sake is: high acidity sakes are best to pair with high protein food such as duck, a heartier fish or red meat. Sakes with lower acidity are best paired with chicken or lighter fish. If you’d like to know more about sake in general, you can read my blog post on Sake Fever here. 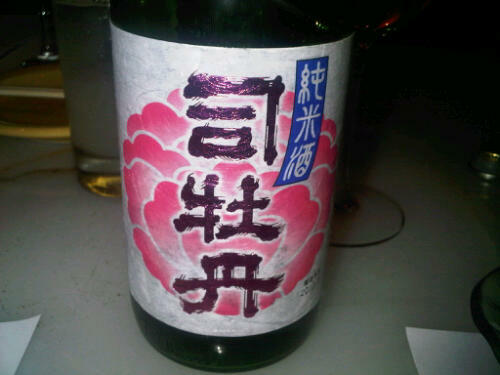 Started with a Junmai, the Tsukasabotan a dry, everyday sake – a sake that one might liken to a table wine. The group agreed that this one had the strongest “rice” taste of all the others we tried. Next up was the Kaori a Junmai Ginjo, polished to 60%, it was a bit more sophisticated than the first, more flavorful and fuller bodied – a more aged taste. The third sake was Momokawa another Junmai Ginjo. This one had a very clean taste and was probably my favorite. Very medium bodied and balanced. We started to progress to the highest-grade sake Yonetsuru which was a Junmai Daiginjo, polished to 50%. Adam expressed that a higher-grade sake will not necessarily mean you personally will like it better. In fact, for me, I preferred the Kaori and the Momokawa over the Yonetsuru. The last sake was very unique because it was the only one that is made in the United States. Rock Sake was an unfiltered Nigori Daigingo, or cloudy sake, from Forest Grove, Oregon. Generally speaking, unfiltered sakes are my favorite but the Rock Sake was sweeter than other unfiltered sakes I’ve had so I still preferred the Momokawa or the Kaori. The group loved the Rock Sake, it was probably the most popular choice. During the sake portion of the event, we also received edamame for the table, our first course was shrimp and sweet potato tempura and our second course was the miso marinated sea bass anticucho. The hot appetizers are a fair amount of food to hold you over until the sushi portion of the class begins. The sushi portion of the class. After the sake segment, the class gets up and stands around Shige-san’s demonstration table as he starts his portion of the class. Shige starts by explaining the purpose and history of each of his knives. A side-note, Shige is probably the most respected and modest sushi chefs in Chicago, he is an extreme talent, recognized within the Japanese community in Chicago, and (very few people know this) he is also really funny and fashionable. I have been a fan of Shige-san since the day I started working at SUSHISAMBA in 2004, he is a consummate professional and a great sushi chef….and…I love him. 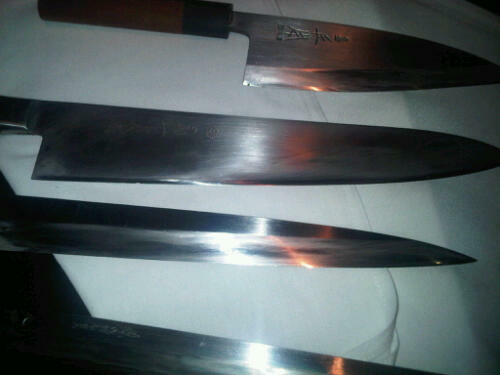 Shige took us through his knives, his English is good, but not great, I just wrote down what exactly he said in my notes. I thought it would be best to literally translate below exactly what Shige said in regards to each knife. This should give you a picture of the way Shige’s portion of the class goes. 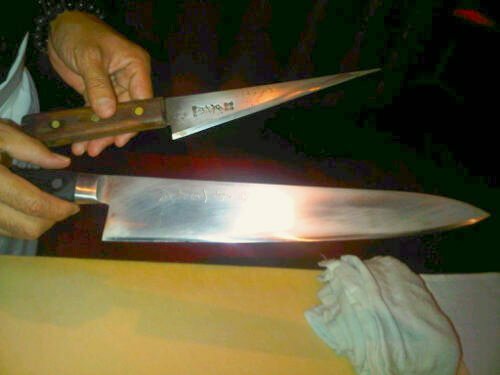 Deba – Very Strong. Cut bones. 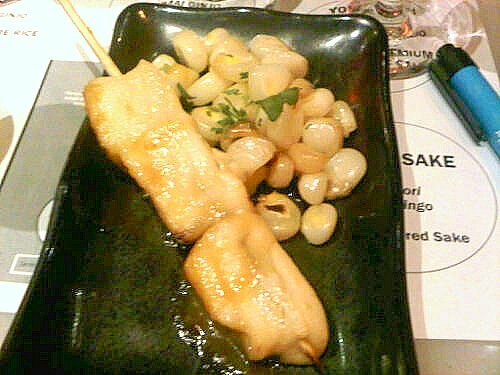 Tako Biki – For Sashimi. Very expensive. 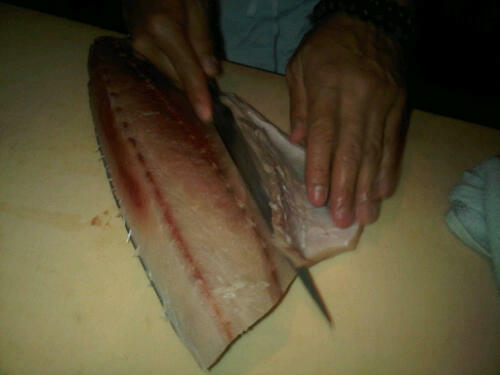 Sushi Biki – Peel skin. Very soft. Shige then showed us a tiny knife. It was his original Jutto knife he started with 25 years ago. The knife had been whittled down to a fraction of its original size from years of sharpening. Another interesting fact that Shige shared with the group, when he first started as a sushi chef in Japan, he spent three years simply preparing the rice before he was promoted from rice cooker. The rice is a tremendously important aspect of making sushi. We each had the opportunity to select our fish: Salmon, tuna or king crab and make a roll. I chose to make a traditional roll with tuna and avocado because I prefer traditional rolls. One thing I learned was, very little pressure is used to roll a sushi roll. I think my roll looked more like a burrito than a sushi roll but I was proud of my burrito-sushi roll. As everyone is making their amateur rolls, the sushi bar is preparing our professionally made rolls. In addition to the roll that I made, I also received half of am Unagi Tamago roll (eel with tuna wrapped in an egg crepe paper instead of nori) and four pieces of sushi (nigiri). Questions I asked the other participants. It was very obvious that I was taking notes during the event and I divulged to my classmates that I was going to be writing a blog post on behalf of the restaurant for my personal blog. They were very happy to answer some questions for me. I wanted to know what they thought of the price point $75 per person, why they wanted to take the class and how they heard about the class. Each couple thought the price was good, fair or appropriate for a high-end cooking class. The reasons for wanting to take the class varied. Some said they took the class because they love sake, they love SUSHISAMBA, they wanted to try something new and they wanted to learn more. 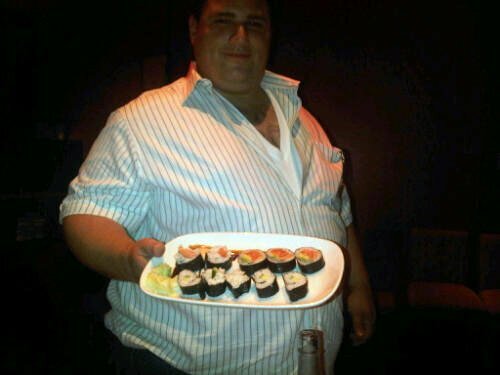 Most everyone had heard about the class from either dining in the restaurant or looking at the SUSHISAMBA website. Why should you take the Sushi and Sake 101 class at SUSHISAMBA? It’s really fun but if you’re not a social person it may not be right for you. There is some downtime during the class where you interact with the other "classmates" and talk about what you like, who you are, etc. It is a very social and fun class. If you have a small group of six to 20 people, this is a great class to book privately. Sushi and sake 101 is a great idea for an upscale bachelorette party, a birthday, team building event or a holiday party for a small office. Disclosure: I am an independent contractor in the marketing department for SUSHISAMBA in Chicago. Some culinary classes are fun to join to learn how the meal is prepared.